I'm terrified of spiders! As hard as it may be to do, please disregard the spider and look at this marvelous cupcake. I absolutely love cupcakes with filling, so this is right up my alley! 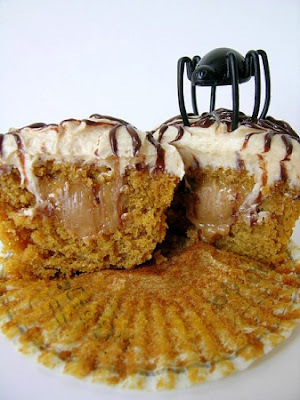 These Dulce de Leche Pumpkin Cupcakes from The Sweetest Kitchen are perfect for after your Thanksgiving dinner. Pumpkin cupcakes filled with dulce de leche and topped with dulce de leche buttercream. Can you tell I'm a sucker for pretty much any pumpkin dessert? That's why I love this time of year! Pumpkin Cupcakes from Martha Stewart. Dulce de Leche is from Recipe Girl. Dulce de Leche Buttercream is from Joy the Baker. Don't forget to enter my giveaway to win a Cupcake Tower! Contest ends November 20th. Yummm!!! Thanks for the link love- dulce is so easy to make. Off to check out the Cupcake Tower giveaway! There is one word to describe this cupcake... HEAVENLY! I absolutely need this cupcake in my life. yummm! Wow, that is one amazing looking cupcake! Sweet blog!